Day 3: After breakfast & checkout, proceed to Havelock Jetty and proceed by sea towards Neil Island in the private cruise. At Neil after being received by our associate, check in to your resort at around 12:30 Hrs. and visit the Neil Kendra. Next take a breath-taking trip to Bharatpur beach; half a kilometer from jetty, it is one of the best beaches with a vast sandy stretch, ideal for swimming. Up next, will be a visit to Laxmanpur beach-I & Laxmanpur beach-II; the former is a secluded beach, with white shell sand and shallow water. It is most famous for the natural rock bridge formation, or locally known as “Local Howrah Bridge” and thus ending the Neil tour in the evening by overnight stay at Neil Island resort. Next day, very early morning before leaving for Port Blair, around 05:00 Hrs. get set go for the spectacular vivacious sunrise view at Sitapur beach; it’s an open sea beach and thus prone to high tides. It is about 5 Kms south and in the tip of the island. The whole sunrise scene is just photographic and pioneerely memorable of its kind. Day 5: After breakfast, proceed by road towards Wandoor jetty (about 28 Kms), where we have the North Wandoor beach, lying very close to the Mahatma Gandhi Marine National Park (M.G.M.N.P), is suitable for swimming and sunbathing and about a kilometer behind we board a wooden boat to Jolly Buoy Island, which is part of the MGMNP, including Red Skin Island. At Jolly Buoy island, aboat called Glass Bottom Boat is provided to view the underwater corals and ornamental plants without merely approaching water barely through the glass panel fixed at the bottom of the boat. Day 6: After breakfast, proceed towards Aberdeen jetty to board wooden boat vessel from Andaman Water Sports Complex to start the journey to the two island picnic tour. Firstly, Ross Island, which now has the remains of the ruined buildings only like the bakery, the post office etc. which was used by the British during their rule on Andamans, it was once the administrative capital of our islands. It is often referred as “The Paris of the East”. Then, secondly you will be taken to North Bay Island (the place printed behind a 20 rupees Indian currency note), which is rich in marine and aquatic wealth, best place for snorkeling and sea walk activities. This is also known as “The Coral Island”. 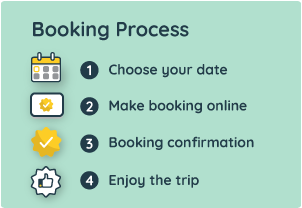 An itinerary is for reference only and is subject to change due to the weather, traffic conditions or local government directives.